During a TV interview with Fox4KC, Adam Dame displays the iPad app that helps him communicate with those around him. Adam Dame lives with cerebral palsy and has profound difficulties communicating verbally, but has A LOT to say. “I want people to understand that even though my body is broken, my brain is just fine. 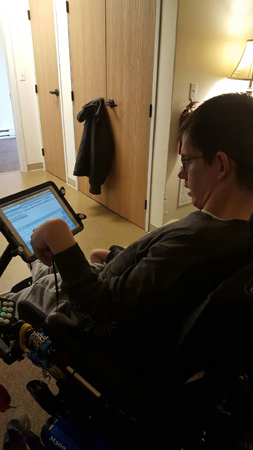 The iPad helps me to communicate so that people understand that," said Adam. 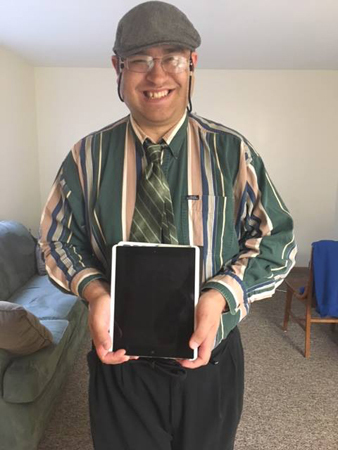 Elliot, who speaks primarily Spanish, received an iPad with a translator app installed, allowing him to communicate with the world, and the world to communicate with him. I want people to understand that even though my body is broken, my brain is just fine. We looked to the autism community for our answers. 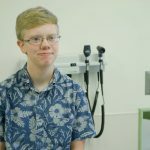 A profound number of people living with autism are either non-verbal or have difficulty communicating. The primary answer to this issue has been the introduction of iPads, which allow for an amazing number of communication methods, including face-to-face interaction, communication apps that allow individuals to construct sentences through text or icons, accessibility to email and social media, and the ability to use assistive technology in collaboration with the iPad to communicate wants and needs. The idea of someone who has no verbal communication being able to press a button to give a simple “yes” or “no” response to a question opens a world of opportunity, and we can provide that ability with an iPad. Amazing! 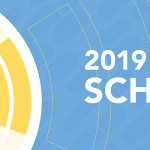 We knew this opportunity could positively impact the lives of a vast number of individuals right here in Kansas City. So, we started the process with one individual, Adam Dame, who lives with cerebral palsy and has profound difficulties communicating verbally, but has A LOT to say. We asked Adam if he would be interested in helping us to prove how beneficial iPads and the associated technology would be for him. He agreed, and we charged ahead. He was given a sentence to attempt to communicate verbally to both staff and peers. The success rate of either staff or peers understanding what he was saying prior to him becoming frustrated and giving up was less than 20 percent. One can imagine the frustration in having your communication partner understand only one out of five things you say. However, with an iPad to construct and speak the sentence, he was understood by staff and peers 100 percent of the time and resulted in a continued conversational exchange over 40 percent of the time! Using the iPad, he was neither frustrated, fatigued, nor avoided by others due to his limited verbal ability. He also reported how cool it was that he finally got to have conversations with two hearing-impaired individuals he has lived alongside for over a year, but has never been able to talk to due to the communication barrier. 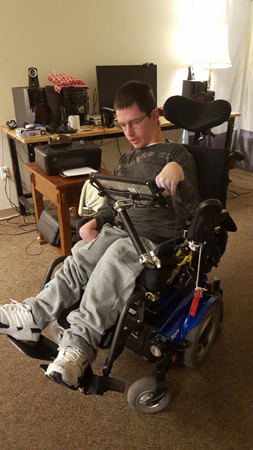 Adam always shares the same sentiment when talking to people about his disability and/or way of communicating: “I want people to understand that even though my body is broken, my brain is just fine. The iPad helps me to communicate so that people understand that.” We are so excited to see the impact this technology has had, and will continue to have on the lives of our individuals, their friends and family, staff, and the community. It doesn’t get much better than that!